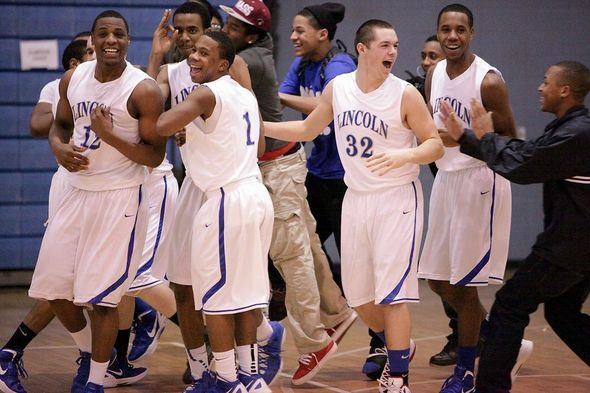 Posted on Tue, Jan 24, 2012 : 11:50 p.m.
Lincoln players celebrate on the court after hitting a buzzer beating 3-pointer in a 51-48 win over Saline. As soon as the ball left his hand, Lincoln’s Brendan Griffith knew his shot was good. He was so confident he held his pose as time expired. 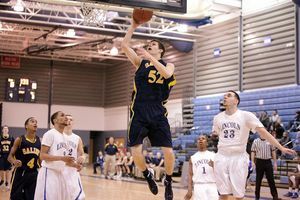 The 3-point shot fell, winning the game 51-48 for Lincoln and stopping a dramatic comeback attempt by Saline. “That was my first time ever hitting a shot like that, I was just lucky I was open and my teammate could get me the ball,” Griffith said. After the bucket fell, Griffith ran downcourt and was swarmed by teammates and fans on the court. Just before Griffith's game-winning shot, no one on Lincoln was feeling good. The Railsplitters were tied 48-48 with Saline after watching a 16-point second half lead slip away. “We should have never been in that position,” Lincoln coach Mike Foley said. “We allowed ourselves to forget what got us there." Down 31-15 with three minutes, 40 seconds left in the third quarter, Saline (6-4) would cut the lead to 38-27 after the third. With four minutes left the game Lincoln's lead was down to 44-39. Saline center Michael Smutny (center) led all scorers with 20 points. The Hornets' comeback was led by sophomore K.C. Borseth -- who scored 13 of his 17 points in the fourth quarter, including three 3-pointers -- and senior Michael Smutny, who had a game-high 20 points. Foley said his team melted down in the second half because of selfish play and mental errors. It started with senior Gregory Lamb getting ejected in the third quarter after an altercation with Saline’s Garrett Stark. Lamb got one technical foul for bumping Stark after a whistle and another for arguing with a referee over the call. Saline got four free-throw attempts (making three of them) and possession of the ball as a result. “What we started to do was play individual basketball instead of team basketball,” said Foley. Although DeMarqus Washington led Lincoln with 14 points, he was on the bench at the end of the game after taking shots early in possessions and not looking for better opportunities. While Foley didn’t want his top scorer on the bench, it was a move he felt he had to make. “When you have to sit down one of your best players because he’s not following protocol, it’s going to hurt your team. But, basketball is a team game and I’ have one goal as a coach and that’s to try and build a team and to win as a team,” Foley said. Lincoln (4-5) never trailed in the game, but held a slim 6-4 lead after the first quarter. However, in the second quarter the Railsplitters would extend their lead to 23-14 at the half due in large part to their trap defense causing so many problems for Saline. “We turned the ball all over the place and got rattled by the pressure,” Seidl said. That pressure would continue to give the Hornets problems into the third quarter. So much so that Seidl made a wholesale change of his lineup at the 4:55 mark of the quarter. The move sparked his team, as after the starters returned with 3:06 left in the quarter the Hornets outscored Lincoln 33-20 the rest of the way. Foul trouble for Lincoln also helped the Hornets claw their way back as they were in the double bonus in the third quarter, but shot 11-for-22 at the line on the night. “We were close, but no one feels sorry for us,” Seidl said. Even though his team played poorly down the stretch, Foley said he was happy with his team's resiliency and ability to rebound from poor performance. And much like Griffith, when that final shot went up, he was confident the right guy was shooting the ball.